She is only three months old, so we have barely ventured out into the world, but, before Shierry was born, I was very worried about the world’s acceptance of her. I often barraged my husband with questions ranging from, “are you sure the labor and delivery nurses won’t recoil when they see her?” to “I know our friends and family members are nice people, but still, are you sure they’ll love her as much and be as happy to see her as they would a baby without a facial cleft?” to “oh god, what about middle school?!? !” Well, the nurses and doctors at the hospital loved her, she was so cuddly and quiet. Our friends and family did not even flinch when they saw her, and every one of them adores her more than a baby has possibly ever been adored in the history of the universe. We will have to see about middle school. We are still working on accepting the future consequences of her clefts, the sure-to-be serious speech issues, the possible food issues, the physical and emotional toll of a million surgeries, and how Shierry will work out socializing with her peers. But here’s the thing about my husband’s and my feelings about her face: they are so far beyond acceptance. We absolutely love it. Because she is missing bone in her lower orbital rims in both eyes, we get to watch as her eyes, even the left one without eyelids, form triangles when she’s excited. 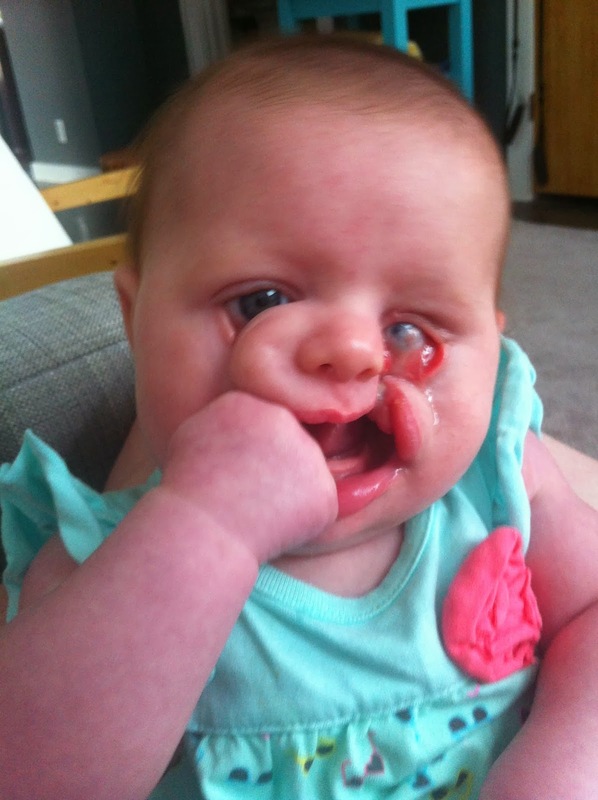 The left cleft has resulted in a valley running through her cheek, and we are obsessed with how, when she smiles, the errant part of her lip on the outside of the cleft flits just that much more outward. As her first surgery approaches, I find myself struggling with one aspect with which I never anticipated a struggle: that her face will be different. When the surgeon replaces the missing orbital rim bone with skull bone, her eyes will no longer form triangles, and when he closes the soft tissue, her smile will no longer be the same. Though I am already missing that smile, I know that we will love every upcoming variation of her face. How could we not? It’s Shierry. Oh Rachel, I just knew your guest blog post would be as wonderful as it is. Thank you so much for sharing with everyone! You are a gifted writer and Shierry is blessed with you both as her parents! Oh yes, that's definitely a part of the post surgery blues. I'm sure you're taking lots of pictures! They are extra special to look back on. We even thought when our daughter Bridget's post-surgery bruises mostly faded, that the little bit left and her shaved head growing back in made her extra adorable and pixie-ish. Thanks for sharing! All I can feel is every baby is beautiful. To be blessed with a baby is beyond words. As a mother, I would be as you are, worried for my child in the school years. I would be that way, because when my child is sad, I am heartbroken. If there is a god then he is also responsible for this condition isn't he? What all loving god would do this to a child? Even after her wonderful little face changes throughout the months & years, her beautiful personality and sweet spirit will be the same :) My son is 31 years old now, but I remember how different he looked after each surgery when he was a wee one. Your daughter is so very lucky to have you to guide her and sometimes worry about her, but she will be a strong, vivacious & lovely girl. Bless her heart and thanks for sharing her story with us. She's beautiful! Such a gift that she was blessed with such strong parents and a loving family. She will grow to enjoy life more than the rest of us can ever appreciate it for. Thank you for sharing your story, and I hope the rest of the world will learn that we are all made different for different reasons, and that judging is not the answer. Thank you. It is so good that you are prepared for that sadness about the face changing, I was not and was hit hard with it. We had fallen in love with his little face and it is difficult to even see his old pictures, but it does wear off as you fall in love with the new look. You have a great outlook, what a strong woman you are!! She is a cutie and she is blessed to have you!